Fibre optic cabling installations offer many advantages over those using traditional copper cables, so should be considered when you are planning a new network cable installation or an upgrade. Faster Speeds. Fibre optic cables have a core that carries light to transmit data. This allows them to carry signals at speeds that are only about 30 percent slower than the speed of light, much faster than copper cables. There is also less signal degradation with fibre cables. If your business depends on efficient handling of high quantities of data, such as financial transactions, large backups or multimedia content, upgrading your core network to fibre optic technology can dramatically increase the speed and efficiency of your day-to-day operations, with far less maintenance and additional equipment than traditional copper infrastructure. Longer Distances. Fibre optic cable installations can carry signals much further than copper cables, although the actual distance depends on the type of cable, the wavelength and the network. In some cases, you can send data up to 40 kilometres without any degradation. Greater Bandwidth. Traditional copper cables were originally designed for voice transmission and have a limited bandwidth. Fibre optic cables provide more bandwidth, allowing them to carry more data than copper cables of the same diameter. Single-mode fibre delivers up to twice the throughput of multi-mode fibre. More Reliable. Fibre cables are immune to temperature changes, weather conditions and moisture, all of which can hamper the connectivity of copper cables. In addition, fibre does not carry electric current, so it is not affected by electromagnetic interference that can interrupt data transmission, and it does not present a fire hazard, which worn copper cables can. More Durable. Compared to copper cables, fibre optic cables are thinner and lighter in weight, can withstand more pull pressure and are less prone to damage and breakage. Lower Total Cost of Ownership. Although fibre optic cables may have a higher initial cost than copper, the durability and reliability of fibre can make the total cost of ownership lower. In addition, fibre optic installations are cheaper to maintain, more durable and require less hardware. ACCL has been a leading supplier of fibre optic installations in London and the South East for more than 25 years, and our expertise has helped many clients improve their business performance and productivity. We always take the time to understand your needs and ideas, and provide free of charge advice and recommendations. Service quality is at our core and we never cut corners when it comes to the quality of our materials and the attention to every detail of the installation. Our skilled and experienced team are highly trained and always up to date with the most recent innovations and trends in the industry. ACCL’s Technical Planning Team will assess your environment and understand your needs to ensure that we recommend the best solution. Our experienced fibre optic installation team offer a flexible service designed to fit the needs of every London company, from small start-ups to large corporations. We will perform a thorough analysis and advise you on a future-proofed solution that is low maintenance and high performing. At ACCL we know that every company is unique and has specific needs and these needs are met through different types of fibre optic installation. Air blown fibre optic cabling is a new form of cable that enables easy replacement of damaged fibres. Each fibre within the cable is separate from the others and can be easily removed by blowing air through the cable, with a replacement fibre being introduced the same way. Easier maintenance: no more heavy construction when you need small repairs. Just blow the old, damaged fibre out and the new one in. Easy to upgrade: when a new, better performing type of fibre is available, you can easily add it to your network. 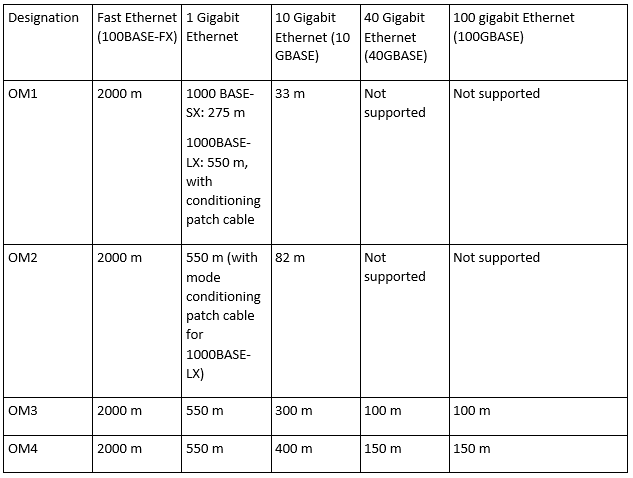 Upgrading from a copper network to a fibre one can be quite expensive. Luckily, ACCL can offer a middle ground, FTTD, which is not only affordable, but also high performing. In a nutshell, this fibre installation service consists of endowing your workstations with fibre optic Internet from your copper-based network. Fibre to the desk installation is popular because you get high bandwidth capacity for voice, data and video, and higher speeds. It is also easy to install, as each group of desks receives a small fibre cable tube, and there is minimal disruption. You will enjoy a faster network within a day! Multi-mode fibre optic cabling provides high bandwidth and speed over medium distances. OM3 and OM4 cables can carry 1 Gbit traffic over distances of up to 550m, but they work up to speeds of 100 Gbit, which they can carry on distances over 100 and, respectively, 150 metres. Single-mode fibre optic cabling is better over long distances than multi-mode because there is only one path through which light may travel. This prevents data from being scrambled and allows for much greater distances. Single-mode fibre optic cables operating at a wavelength of 1310 nm can carry 1 Gbit traffic over distances of up to 5 km, and 10 Gbit traffic up to 10 km. While they are limited in terms of bandwidth compared to their multi-mode counterparts, single-mode fibre optic cables have better distance coverage and they tend to be easier to maintain. The ACCL team has worked on countless challenging single-mode fibre optic installation projects in London and the surrounding area. Our fibre optic cabling project for Southampton FC was a great success because our skilled team of engineers and project managers achieved a high-performance network. Being accredited by some of the biggest brands in the industry means that our engineers and other employees are certified by the companies and abide by their strict standards in every project. It also means that your fibre optic installation will be done with the best materials currently on the market. We also work with some of the leading brands, to ensure that their businesses operate as efficiently as possible. Allow our team to tackle your entire fibre optic installation project and we will always be on schedule and within budget. You don’t have to take our word for it, check our testimonials page to see what our clients have to say about our services. Allow our team to tackle your entire fibre optic installation project from day one to completion – we are always on time and within budget. You don’t have to take our word for it. Check our testimonials page to see what our clients have to say about our services.